Smart Watches are very popular now days and become very important in the world of IoT. Smart Watches not only look cool but they are very useful too. But their prices are very high and anyone just can’t afford. 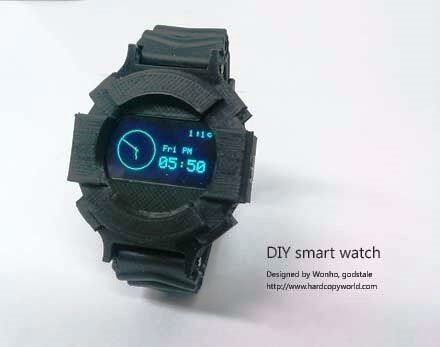 So here we are sharing a very cheaper solution that is Arduino Based Smart Watch. This guy TORTUGA made this Smart Watch as a open source project, and named it Retro Watch. This Retro Watch can be synced with your Smart phone and can show all types of notifications from phone, like for unread emails and messages. It can show Phone’s System info like Battery Status, Wi-Fi status etc. It has RSS Feed feature, and you can use it to monitor RSS feeds from any website like for setting whether forecast alarm. It has many Clock styles to display time and has 65 icons for display notifications. All information is updated in every 30 minutes. This Watch has many other features. This Smart Watch is mainly using Arduino Pro Mini, 128x64 OLED graphic display, HC-06 Bluetooth Module, LiPo (Lithium-Polymer) battery and a FTDI Module. These components are stacked one over another, to make it compact, having insulator black tape in between every ‘layer’. OLED and Bluetooth module are connected to Arduino Pro Mini. Arduino Pro Mini is used because of its small size. A Button is connected to Arduino to serve as Momentary Reset Switch for Smart Watch. Source Code for Arduino and Android app for Smart phone have been provided in the tutorial. This DIY Tutorial explains every step to build this Smart phone. FTDI Friend is used to Burn the code into Arduino Pro Mini from computer. You need to install OLED Adafruit Graphic library before burning the code. So now you just need to pair your smart phone’s Bluetooth to the Bluetooth module, connected to Arduino and you are ready to go. This Clock is further improved here by Bryan Smith as Helios Watch (shown below) with Larger Screen, Vibration, Internal Battery charging etc.